Last Saturday I had the pleasure of attending my first Canadian EdCamp. I’d first been exposed to the EdCamp movement last year upon attending EdCampDetroit and I was blown away by the quality of the PD (teacher-directed) and the vibrant community that existed in our area and, through Twitter, around the globe. I hadn’t heard about the previous EdCampSWO but made the determination then that I would definitely be in attendance at upcoming EdCamps. 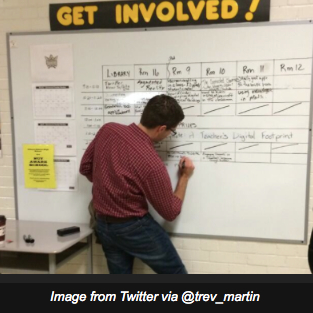 This years EdCamp for South Western Ontario met at Tilbury District High School. They coordinated to be able to connect with EdCamp London, happening at the same time. It was great to have one session as a Google Hang Out with participants in London, as well to stream the keynote address by Doug Peterson from our location to theirs. For those of you who might not know how an EdCamp works, it is a gathering of technology-using educators and education stakeholders who gather for a day to attend or facilitate a variety of professional development sessions. The topics are decided day-of based on the interests, needs, and knowledge of the attendees. A whiteboard grid is posted in a central location with a handful of session rooms listed and a time-slot. Participants select whichever of the multiple sessions occurring in each time slot they feel they’re most interested in and show up to learn. Because we are all grown-ups and we can change our minds and learn at different rates and not hurt anyone feelings when we’re honest about that EdCamps are free-flowing, giving participants full permission to get up and leave mid-session and pop in to another one as they see fit. Participants may choose to become presenters or facilitators, as well, simply by adding to the whiteboard the topic they feel they can contribute something in a discussion about. Furthermore, if they’re hoping to learn something in particular and don’t see it on the board, they can write up a session and state “want to learn” or “who knows about…?” and others who wish to learn as well as those who feel they have some knowledge to contribute can show up for that session. The biggest problem, of course, is that you can’t attend every session, especially if you’re facilitating. That was the case for me this year; there were several topics I was hoping to learn more about that I didn’t see on the board so I volunteered to facilitate them but that meant that, although we had some great discussions, I felt I’d missed out somewhat on a lot of the other great learning happening at the same time that I couldn’t just pop in to. One of the best things about this experience was getting to meet some high quality tech-loving people from our neighbouring school-board, Lambton-Kent. It was very interesting to hear how a different Board was approaching technology in education and see the good things they were doing. “The Future of Augmented Reality” video showed the possibilities of this virtual world hidden in regular objects. Ie. hold your phone up to the sky and load the weather data, with related graphics. I had heard of Aurasma for the first time last year at EdCampDetroit (surprise) and was impressed with the concept but had some trouble with the app so never went further in implementing it with any of my students. It was wonderful to see an example of a teacher who was making it work and to pick his brain about things that were tricky before. At the end of the session we had time to play with Aurasma for ourselves and make a quick Aura as a test. 2. The app will open to the scanner. If you want to make a new Aura, you need to touch the Aurasma icon below the scanner and then the add button, etc. 3. You will be making your “overlay” (the video, or whatever, that will be augmenting the reality) first. 4. Then you will be capturing the image that the Aura will be layered upon. Images have to be crisp, preferably colourful, and unique or they won’t take. Also, the image won’t take until the little tri-coloured slider bar below the screen slides into the green. In Mr. Pattison’s class, all students create in Aurasma under the same account. This allows the teacher to manage everything students have made because choosing to make an Aura “public” is literally open to the world, as expected. This led to some discussion about whether that’s safe or not. The conclusion was that it was, (provided the video and images of students have a Media Release already filled out) – random people scanning and watching the video would have to be in the building to scan the poster or have access to the book cover etc. themselves. (To view book reviews and other interesting Auras check out his channel: Tecumseh8). He also told us that a very short time limit and file size limit exists in this app, about a minute. Great for ensuring that we make every word count! There was also some suggestions for using this app for students with ESL to increase vocabulary by having it speak the name of the object when the object is scanned. We also talked about Layar. I had never heard of Layar. This is a little more user-intensive than Aurasma. 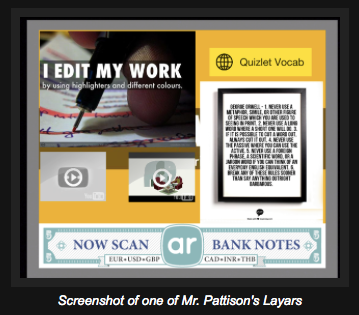 Mr. Pattison told us about how he pastes a poster, for example a title board of the Narrative Success Criteria he developed with his students, to each of their desks and then the students use the Layar app to scan the poster and they get all the content he posted, most recently updated. I thought this was fascinating! His students all bring their own devices to school, mostly iPods, and he has printed a simple colour poster, using it as the marker link and then students get access to all sorts of things they would use to help them fulfill their success criteria, including videos, quiz vocabulary, a slideshow presentation in HaikuDeck, and more! Seeing this in action feels well beyond me, right now. But it is certainly something I’ve added to my “things to look into in the future” list! As an added bonus, this caused me to reconsider the usefulness of HaikuDeck as a whole. The slides were beautifully and professionally done. We discussed how the purpose of HaikuDeck is to “force” presenters away from creating slideshows containing pages of 12pnt font that the audience has to read (or worse, is forced to listen to THEM read! ), and instead use the slideshow the way it should be – as a series of powerful images with FEW items of text that a presenter then TALKS to us more about. Sounds good to me! I was surprised that no one had added this topic to the whiteboard already. Maybe it wasn’t as well-known as I’d assumed? More likely, it was because EdCampSWO was smaller than some of the more well-established EdCamps (for now). Regardless, I decided to throw my hat in the ring and see if anyone wanted to learn and talk about this. I was pleased to get to chat with about 10 other people, and even more pleased when their wonderful tech people helped me rustle up an adaptor so the Mac could connect to the projector. No one in the group seemed to have really heard of the Hour of Code initiative and I was pleased to be able to share what I knew about it. We discussed the laptop programs and iPad apps that Parkview’s 4-8 students are working on, and discussed the positive results and challenges we’ve seen with this sort of learning thus far. I’m still developing a previous post about Hour of Code that you may wish to visit and check back on every once in awhile to get some of those details. There was some discussion about what some of the earlier games had to do with “actual” computer programming since they are designed as drag and drop blocks rather than using coding language. Hopefully, we cleared the confusion up when we discussed how these apps were designed to introduce children to the logical thinking required for programming and slowly scaffold them in to understanding more difficult concepts, such as repeating loops, if/then and if/then/else statements, and streamlining the amount of instructions to fit within smaller parameters. After that, students move on to more “traditional” coding apps that use certain language and numbers to program objects to do certain things. At higher levels, control is released even further and students are encouraged to “code something amazing” to share with the class. This provides a sense of purpose and momentum as they work through the lower levels. We discussed where this was taking us (better thinkers, independent problem-solvers, and oh yeah, jobs), and how I hoped to introduce the students to programs and apps that actually allow them to create their own games or apps that can be shared with a wider audience. We also talked about plans to introduce Dash (a free, web-based program that teaches students how to use html, java, and css to code webpages). I joined this session already in progress and it was interesting to hear the thoughts of the teachers and administrators from both London and Tilbury discuss what makes a good leader. The overall consensus was that a great leader is much more than just a “manager” and respects the professional capacity of the people around her/him and gives them the autonomy to do as they see fit. Feel free to check out the Storify I pulled together (quickly) of tweets related to the leadership hang out. And then it was lunchtime!